You should always consult with your professor if you have specific MLA questions. 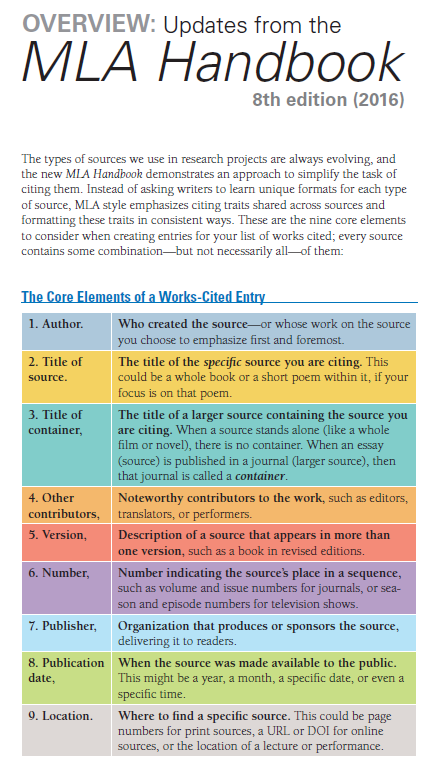 A set of guidelines for formatting academic manuscripts and citing materials used by other writers. It is most often used by writers in the humanities and liberal arts. Citing sources you've consulted gives your paper credibility, and adhering to MLA's citation guidelines protects you from unintentional plagiarism. The MLA Handbook, 8th edition, may be found at the Speed Library Reference Desk on the library 2nd floor. corner of page one on separate, double-spaced lines. Title centered directly above the text of your paper. Do not italicize, underline, or place title in quotations.